Well, this seems to be a nice, dead part of the forum... but I figure this is the best place to put this since it is iRO Chaos-specific. I see a lot of people wondering time and again if a particular MVP Card has dropped. The purpose of this listing is to inform others that a particular card (if implemented on iRO Chaos) is dropping and has dropped in the past. It is also utilized to help inform the GM Team about incorrectly implemented drops so that it may be corrected. Several years ago, I discovered that Lord Knight Seyren was not dropping his card (got 8 drops, no card present), so I brought it up to the GM Team and it was re-implemented into his drop table. Of course, the only way to truly know whether or not a card is correctly implemented is for said card to actually drop. It can be a volatile system since nobody really knows if it's bad luck across the server or the card simply isn't in the drop table. As such, this list can only be fully exhausted with time and help. If you would like to help fill out this listing with proof of drop for the rest of the community, please post in here or PM me. Please provide a screenshot with proof that it is on iRO Chaos (an Eden screenshot would do well) or meet me in-game and have equipment open (can be done entirely privately at your request). I will keep everybody anonymous that does not post publicly in this thread. Anything Unconfirmed / Unknown, I have never seen proof of them existing nor have I heard of anybody saying one dropped. Sometimes their origins are simply unknown. Anything Rumored are cards where people have said, "it dropped" or "someone owns it" but without any verifiable proof. Anything Reasonably Likely can be assumed that it drops because other similar cards have dropped, but the specific card listed has not. So, for example: A couple Bio4 MVP Cards exist, so the assumption is that the other Bio4 MVP Cards can also drop. Anything Confirmed by Staff - No Known Card in Existence is pretty self explanatory. It is said to drop and be in the drop table, but nobody has come forward to say they own one. If an implemented card is not on this list, it exists on iRO Chaos. This listing is up to date as of March 2nd, 2019, with the recent removal of Faceworm Queen from the subheading "Unconfirmed / Unknown". Edited by Jerbear, 02 March 2019 - 08:56 AM. Apparently someone claimed that he/she sold Nightmare Amon Ra Card in the past, maybe ask him/her about details and how much the card was sold? Nightmare Amon Ra has been recently added to the MvP drop listing. Previously the MvP dropped Normal Amon Ra card. This was double checked by Campitor not long ago. How recent are we talking? 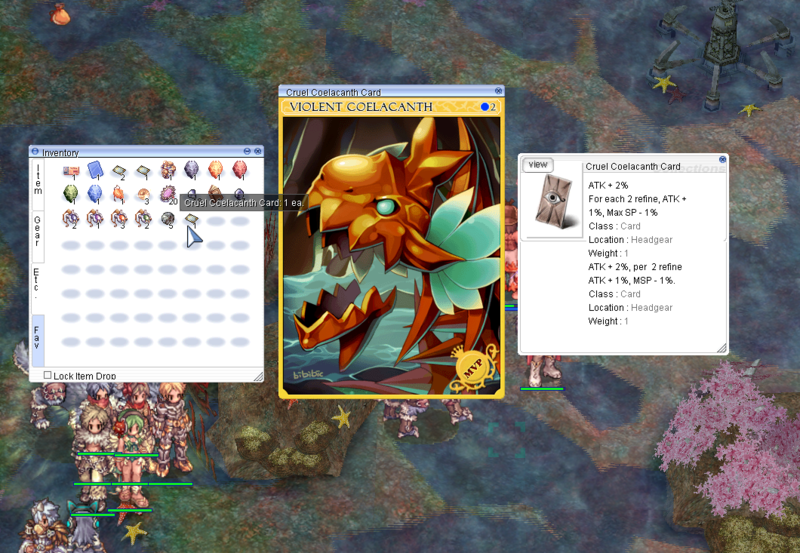 I remember seeing someone on the facebook Chaos Market group having one of the Coelacanth cards, the +50mdef armor one (dont remember wich is wich) a few years ago. And a High Wizard too, apparently, which is incredibly weird. I'm not going to pry though lol. 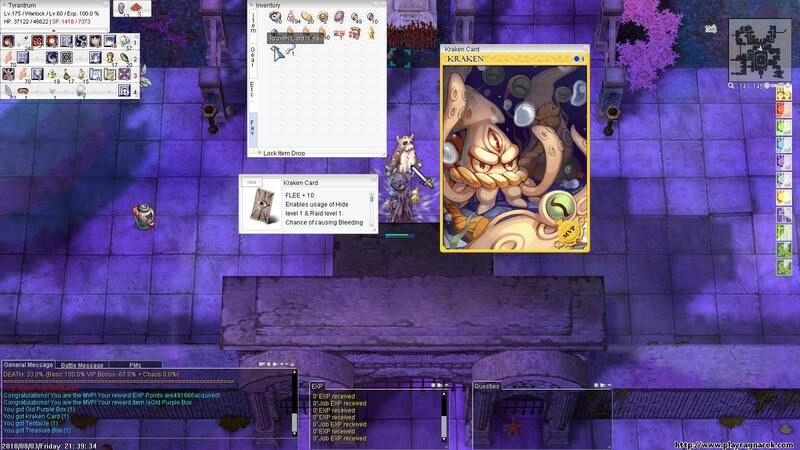 @Cinnamod, I've inquired several times about Nightmare Amon Ra, too, over the past year. It's getting to that really unlikely range of kills where so many have been killed since the card's implementation that it's strange that the card has not been dropped yet. Although, maybe it has and the person never said a word. Always a possibility. The server might also be on a legendary bad luck streak as a whole when it comes to it, too. There's a small group of people who kill it more than anybody else (lookin' at good ol' Uber, among others), and they certainly do not have one yet. They haven't reached that upper plateau of kills-to-card-drop-ratio quite yet, but they're getting there pretty quick. I'm just curious if the card is at the correct drop rate or not. Under suspicion of Naght Seiger Cards not being as abundant around ~2 years ago, Heimdallr said he had the drop checked and that the card was dropping, but was 'not dropping at the correct rate' and that it would be remedied with an upcoming maintenance. It was never in any patch notes, but I imagine it was fixed as he said he'd make a priority note on it. It just makes you wonder if it's similar to that case or not. Nightmare Amon Ra dies practically on the hour every hour every single day. It's well over 8,000 kills in a single calendar year, which puts it in that 90 percentile range of expected card drop given x amount of instances occurring--especially with HE Gums being used on most of those kills. Again, the assumption is that the card hasn't ever dropped on Chaos--but maybe it has. Nobody really knows and only time will tell. One day, everything on this list should be answered for, though. We'll just have to see when one day finally is. Edited by Jerbear, 23 January 2018 - 08:57 AM. On bRO Nightmare Amon Ra still dropped regular Amon Ra card after it's card suposedly got implemented. (was dropping normal Amons while the card wasnt there), and took a good while after that incident to get the drop fixed. -"Campitor has double checked this and the card was officially implemented somewhere at end of Sept 2016. Previously, the MvP was dropping Normal version of Amon Ra simply because the nightmare version of the card did not exist on iRO servers. Being said, right now Nightmare Amon Ra card drops Nightmare version of the card with the appropriate effects. It was double checked in the database as well." This card is on my hand . Regarding Nightmare Amon Ra card, I don't think someone holding it has never been noticed by others. Edited by LinskyLT, 25 January 2018 - 05:59 AM. Didn't know Lord Morocc had a card. Do the other mvps in the Temple of Demon God instance have cards too? Well apparently someone called Thmeryah claimed to have possessed and sold Nightmare Amon Ra card, would be nice if he/she can disclose some information such as when it was dropped, how much the card was sold, etc. Faceworm Queen card can be dropped ?
" MaxHP - 10%, Cri + 15. Edited by Combattent, 30 January 2018 - 01:28 PM. I think its not implemented yet, so many ppls are farming FW instances and not a single drop of FW Queen Card, even with RNG this should be enough sample size to imply that the card doesnt exist on iRO. Of course, Id be glad if someone proves me wrong, so Id be more excited to do FW in future. Faceworm Cards are not implemented yet. Edited by Jerbear, Today, 11:12 AM. Updated for Stephen Jack Ernest Wolf! Edited by Jerbear, 04 May 2018 - 07:03 AM. 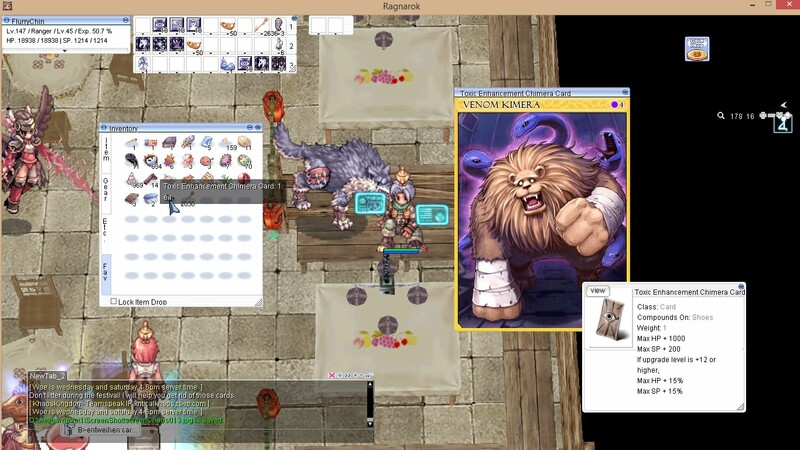 Haha i am Founder for Toxic Enhancement Chimera Card. Just Cutie now to complete the new MVP Cards that were just implemented. Kinda crazy. August Edit. Guess that's confirmed! Edited by Jerbear, 03 August 2018 - 07:44 PM.